The FCC Mobile Broadband Test is a free iPhone app from The Federal Communications Commission (FCC) to do quick and easy tests of your upload speed, download speed, and latency of your mobile broadband connection. The free app is seriously simple to use and works with a single tap. To get started from the main Test tab, tap the green “Begin Test” button and watch as the graph shows your upload and download speed in Mbps, and network latency in milliseconds. The app also comes with very useful animated graphics that explain the tests visually quite well using colors. Once you’re done with your tests you can view the results in the Results tab, along with a list of any previous tests you’ve done. Tap on each test to see a full array of details including date, time, network type (WiFi, 3G, Edge etc. ), Server location, Extenal IP address, Internal IP address, Latitude, and Longitude. Finally for easier access you can share or export your speed test results by tapping the + icon which creates a CSV file and generates and email that you can fire off to anyone. As a final note, the FCC might pool the results of the tests done by the users of this app to “analyze the quality and coverage of mobile broadband connections across the United States as part of a larger effort by the FCC to identify areas with insufficient or nonexistent access to broadband.” This is a really good idea and hopefully something that if enough people use the app, can make companies accountable for the network speeds they advertise to their customers. Now here is a win/win situation. A great free network utility iPhone app that will help consumers in the long run as well. 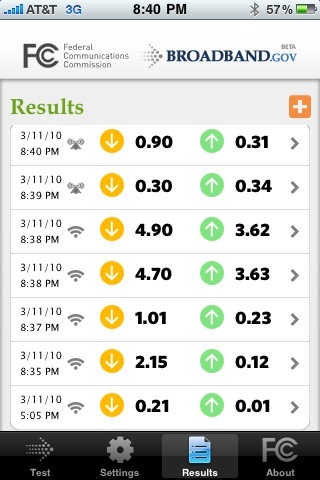 AppSafari review of FCC Mobile Broadband Test was written by Joe Seifi on March 12th, 2010 and categorized under App Store, Net, Utilities. Page viewed 4256 times, 3 so far today. Need help on using these apps? Please read the Help Page.